Be alert to charity scams. Urgent appeals for donations may not be on the up-and-up. Check out the charity with the Better Business Bureau's (BBB) Wise Giving Alliance, Charity Navigator, Charity Watch, or GuideStar. These organizations provide lists of charities they have screened that are raising funds for specific causes, like Hurricane Harvey or Irma relief assistance. Check out the Federal Emergency Management Agency’s (FEMA) volunteer and donation page. It outlines the best ways you can help people and communities who are impacted by a disaster. Give directly rather than through a paid fundraiser. Professional fundraisers get a percentage of your donation, sometimes 50 percent or more. 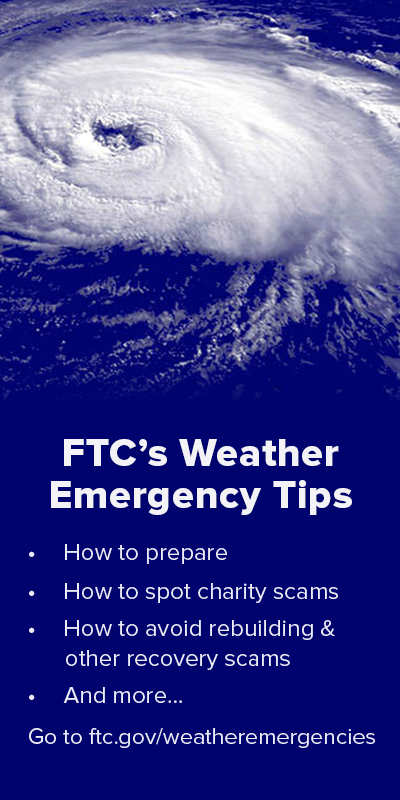 The FTC and the Red Cross have advice on how to cope if your home is flooded. Call your creditors and ask for help. If your home is uninhabitable, contact your lender to discuss the options you have with regard to your mortgage.